Go out from the “Queen’s Square Exit” of the station, take the escalators from the 3rd basement to the 2nd floor of “Queen’s Square Yokohama” (get on the red longer escalator first, and then the shorter one, both in the back left side). On the 2nd floor, turn left on the main mall street and cross the bridge (Queen Mall Bridge). Go up to the 2nd floor by the “yellow see-through elevator” on the left hand side of the red escalator. Get off on the 2nd floor, go to right hand side, turn left on the main mall street and cross the bridge (Queen Mall Bridge). Walk toward Minato Mirai by using the moving walkway. Take a taxi from a taxi stand in front of the station (5 minutes). Transfer to Minato Mirai Line or JR Keihin Tohokou Line. * Actual travel times required depend on the facilities being used and traffic conditions. * Transfer times are not included. Click the image above to open a larger map. From Tokyo International Airport: about 20 minutes by car, about 40 minutes by bus, about 30 minutes by train. *Actual travel times required depend on condition on the road or at the airport terminal in question. Transfer times are not included. Take a train on the JR Narita Express Line, get off at Yokohama Station, change to a train on the Minato Mirai Line and get off at Minato Mirai Station. (about 100 minutes). Airport Limousine (Airport shuttle bus services)About 110 minutes by direct Airport Limousine to PACIFICO Yokohama. About 100 minutes by Airport Limousine to YCAT (Yokohama Station) and then a taxi or train on the Minato Mirai Line from Yokohama Station. *Actual travel times required depend on road conditions or conditions at the airport terminal in question. Transfer times are not included. *When you take a train on the JR Keihin Tohoku Line or the Yokohama Municipal Subway, get off at Sakuragicho Station. 20 minutes by train from Shin-Yokohama Station on the JR Tokaido Shinkansen Line. 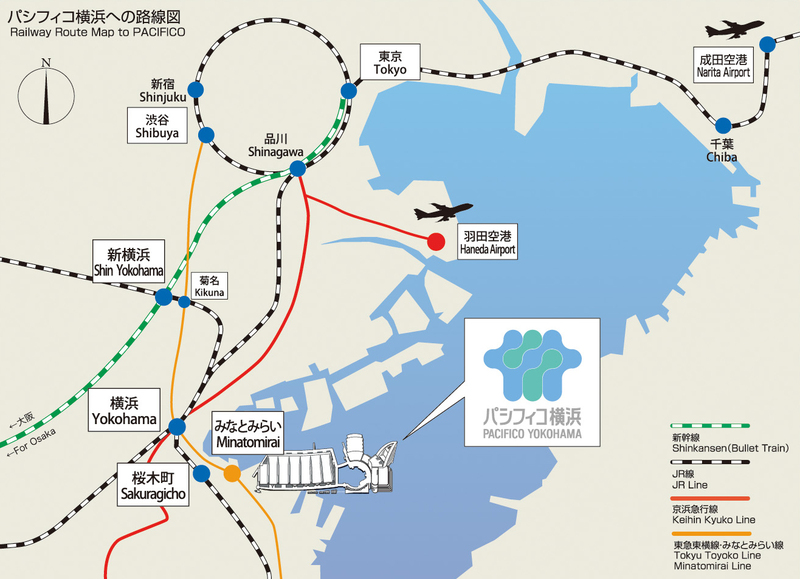 *You can also get to Sakuragicho Station by taking a train on the Yokohama Municipal Subway or the JR Yokohama Line. *Actual travel times required depend on the facilities being used or condition on the road. Transfer times are not included. Two minutes from Minato Mirai Ramp Exit on K1 Yokohane Route of the Metropolitan Expressway Kanagawa Route. After exiting Minato Mirai Ramp, go straight in the direction of the sea and you will find PACIFICO Yokohama in front of you. *Actual travel times required depend on road conditions.